The more you CHR, the better you are. The computer software VanDeGraphGenerator analyses, generates and visualizes line graphics. We used the VanDeGraphGenerator algorithm to classify and generate designs for mason’s marks. Now an extension of VanDeGraphGenerator VdGG+ turns this medieval craftsmanship into contemporary abstract digital art. More information on https://www.ai-art.info/. 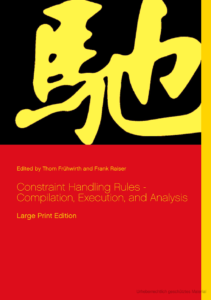 The book “Constraint Handling Rules – Compilation, Execution, and Analysis” has a new edition, because the old one is out of print. By popular request, the book format has been enlarged. See Google Books. ICLP is the premier conference on foundations and applications of logic programming, including but not restricted to answer-set programming, non-monotonic reasoning, unification and constraints based logic languages, constraint handling rules, argumentation logics, deductive databases, description logics, inductive and co-inductive logic programming. What is disclosed are a novel system and method for inferring types of database queries. A method for implementing soft constraints in scheduling comprises receiving a description of circuit behavior. Systems, methods and articles solve computationally complex problems. Example embodiments provide data query language features that may be used to express optimization problems. A position detection system of a mobile terminal includes a small zone communication system such as the PHS system, and a center station connected to an exchange station forming the PHS system. Namur, Belgium, 9 Oct. – 11 Oct. 2017. London, UK from 12-15th July 2017. Maun, Botswana, at Cresta Riley’s Hotel, 7-12th May 2017. Melbourne, Australia, August 29 to September 1, 2017. After suggestion by Falco Nogatz, it is now possible to run the toplevel in recursive mode such that global variables remain bound. Nice for teaching CHR. Not clear what the other use cases are. Use ?- set_prolog_flag(toplevel_mode, recursive). to enable this. As seen in the last query, the contents of the constraint store are printed by default on every query. So, for more advanced usage, it might become handy to use the recursive toplevel mode with CHR’s flag chr_toplevel_show_store set to false and explicitly call the meta-predicate chr_show_store/1. PADL 2017 welcomes new ideas and approaches pertaining to applications and implementation of declarative languages. PADL 2017 will be co-located with the Symposium on Principles of Programming Languages (POPL 2017), in Paris, France. Feedback is very welcome – it will stay online for about two weeks only. The 2nd Global Conference on Artificial Intelligence (GCAI 2016) will be held at the Freie Universitaet Berlin from 29th September to 2nd October, 2016. The conference, which addresses all aspects of artificial intelligence, is being organized by LRG (http://www.lrg.global) and the Freie Universitaet Berlin. The program chairs are Christoph Benzmueller, Raul Rojas, and Geoff Sutcliffe. The call for papers can be found at the conference’s website. Created by Thom Frühwirth in 1991, the CHR language has become a major specification and implementation language for constraint-based algorithms and applications. Algorithms are often specified using inference rules, rewrite rules, sequents, proof rules, or logical axioms that can be directly written in CHR. Based on first order predicate logic, the clean semantics of CHR facilitates non-trivial program analysis and transformation. About a dozen implementations of CHR exist in Prolog, Haskell, and Java. More than 100 projects use CHR. © Copyright 2016 Falco Nogatz, Thom Frühwirth. Design by Styleshout.